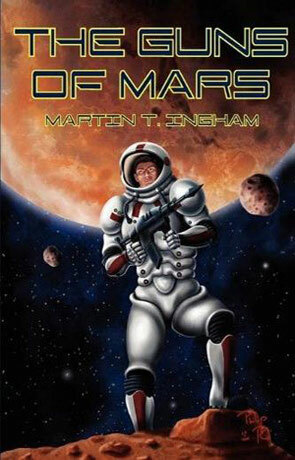 The Guns of Mars is a science fiction novel by Martin T Ingham. Morgan Asher finds himself a reluctant Martian, part of the colonization effort so that his wife can fulfill her lifelong dream. It isn't long after arriving on the red planet that Morgan discovers a sinister plot by a group known as the Scientific Fundamentalists (Scifes) to infiltrate and subvert their mission. Can Morgan find a way to expose these enemies of freedom before their conquest is complete? The Vision laid out in this novel is one of political revolution, ideology and the conflict that can arise between science and politics (or politics and anything else for that matter). Set against the backdrop of the colonisation and eventual terraforming of the red planet, the story is told principly through the eyes of the couple Morgan and Lorna who join in the dream of a frontier life on another planet. The title inself refers to Morgan's small collection of guns (mostly antiques) which are used as a vehicle to explore the rights to bear arms, itself a metaphor for the freedom of indiviuals rights. The style is very uncluttered and easy to read and the use of technology very convincing - especially the way that physics differs on Mars due to the difference in gravity and atmosphere although this isn't given over to "hard science fiction". The pace is a little disjointed, quite laid back in some places while in others a little rushed although the action scenes are very well scripted. The story itself did seem to take some time to really get going while the characters are pleasent enough but seemed to lack the definition needed to turn them into real people. For me it just wasn't there and as a result I found it quite difficult to care enough about the characters and felt my emotions weren't really engaged. The first part of the novel also felt somewhat out of place, essentially Morgan spend a number of years immersed in a very advanced Virtual Reality simulation until Lorna came along and rescued him and while I can understand the plot device used, for me it didn't gel with the remainder of the story. The Guns of Mars is limited by the execution of the plot and lack of convincing characterisation however there are some great ideas and the novel is an intelligent political and social commentary on the human conditon. Written on 13th March 2011 by Ant.